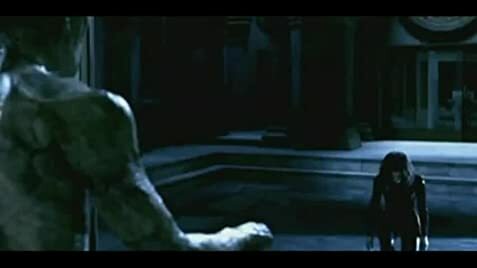 In the newly released 2017 4k remaster of Underworld, the scene where Michael recounts the events of Sonja's demise when he speaks with Lucian in the film is replaced with the actual scene from Underworld: Rise of the Lycans (2009) instead of the original flashbacks used in the 2003 version. (at around 1h 40 mins) When Viktor pushes Michael through the wall, as he lands in the water you can see several large pieces of the broken wall floating on the water behind him, showing them to be polystyrene. In the original release of the movie, Jázmin Dammak played the part of Sonja, Viktor's daughter, in the flashback scenes, however after the release of Underworld: Rise of the Lycans (2009), a version is available (most notably on U.S. Netflix) where scenes with Rhona Mitra were inserted in place of the original scenes.